If you’ve seen Ready Player One you’ve seen an omnidirectional treadmill (ODT) in action. For everyone else who hasn’t seen the blockbuster film, virtual reality treadmills that can be walked on in all directions aren’t like those found in gyms, they come in different designs ranging from a single concave platform to a complicated deck of rolling mechanisms. We’re here to break it down for you so you can stay on trend and up to date with the latest and greatest VR ODTs. The original KAT Walk has a larger rounded ODT plate and overall platform that players walk, run and jump on. It has a large support post with security harness that’s worn as users play games like Sairento VR, QuiVr, Space Pirate Trainer, Fruit Ninja VR, and other compatible games. The KAT Walk version is much larger in size and weight clocking in at 421 pounds. It tracks foot movement with sensors instead of using a laser system like the mini. KAT Walk ODT is a great solution for businesses like gyms, arcades, and large-scale location-based experiences. To purchase the KAT Walk ODT treadmill you’ll have to send an inquiry and fill out a form on their website. The Virtuix Omni is an omnidirectional treadmill that has a round and concave plate that you use with a special pair of shoes for a full range of movement like running and walking forward and backward, but disappointingly has no mechanical support for crouching. The Omni secures players with a waist harness and wrap around circle that keeps you safe and on the platform as you turn up the heat and compete in VR. VO’s Omniverse is where players go to play games like QuiVr, Project Ghost, Omni Arena, Primordian, Karnage Chronicles and more in VR. Their ODT will even track gameplay hours and show you data on which games that are played the most. This is a great option for businesses like arcades and gyms that have room to fit one or more of them in a space for multiplayer gameplay. 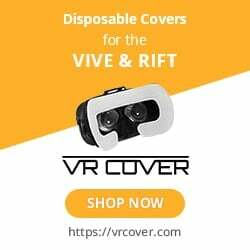 To purchase one you’ll have to contact Virtuix and request a quote on their website. Vue VR’s omnidirectional treadmill also has a smooth concave plate you can walk, crouch and run on with special shoes. Their tech keeps players safely on the platform as they move around in VR games with a directional support beam for their CV model or a moving backplate with their HV model. Players are fully supported with harnesses that they strap into and play games like Narcosis, Dead Secret, Serious Sam VR: The First Encounter, Serious Sam VR: The Second Encounter, Fallout 4 VR, and other PC games that are VR-ready. VUE’s ODTs have an interactive standing console that displays games and acts as a command center for the tech but also have options to get a model without one. VUE VR’s CV and HV models are a business-friendly ODT for arcades, family fun centers, and homes that have a gaming space to use it. Visit their store to purchase. If you’ve seen Ready Player One you’ve seen the Infinadeck ODT. It’s a wider and larger platform that isn’t concave like the treadmills above, theirs has a flat deck design that you walk on in different directions. Road to VR says that “the treadmill can move users in arbitrary directions, which means it can be used to counteract a user’s movement in any direction.” Players can walk on the Infinadeck when they are secured inside a large ring that gives you room to walk around in virtual worlds. Which virtual worlds is the question. In the same article, Ben Lang shares that the company is now pairing Vive Trackers to users that are walking on the treadmill for better waist and foot tracking. This is a treadmill that could be great for larger business spaces and will need to get smaller if they want to make it into homes. Infinadeck is currently accepting applications for their Software Development Program and their Beta Unit Testing Program on their website. This is the ODT that I was talking about earlier that has the platform made up of individual rollers that are set up in a large 4.2 m diameter circle and weighs 3,300 pounds. Players walk on top of the rollers as they play VR games and walk around in 360-degrees unhindered. What’s interesting about this treadmill is that it can move players in any direction with the motorized rollers. Watching players move on it makes it appear as if they are going to roll off the edge of the Omnideck platform, but they’re safe even without a harness or boundary railing to contain them. Players can walk and run around in different strides and can even jump or crawl if they want to. The Omnifinity treadmill has been used to play Battlefield 3, has been demoed with PAYDAY 2 VR, Take and Hold, and the escape room game BLAST DOORS. This ODT is large enough for warehouses and large gaming areas. To get on their mailing list you’ll need to sign up on their website. Omnidirectional treadmills have the potential to turn gamers into fit warriors. Businesses and individuals who can find one that matches their needs and bank account can look forward to getting one in the near future. Let’s hope that articles like this will drive more indie and AAA studios to pair existing VR games and create more compatible ones in the future with the range of existing OMDs.